The section between Winchester and Amberley has many wooded areas, offering shade from the sun and a variety of views. It is steeped in history from start to finish. The Western section in 3 days walking is our shorter option, finishing with a long day between South Harting and Ambeley. This is another relatively easy National Trail which is clearly way-marked along the length of the path. A good route for a first long-distance walk. Terrain: Varied - but these are gentle downs and heathlands, not mountains! The path spends most of its time on the south downs, undulating over farmland and through woodlands. What’s it like underfoot? Pretty good. Well maintained paths, tracks, and green lanes throughout, although sections can get a bit muddy in wet weather. How Much Up & Down? Once up on the Downs, the trail is rolling rather than hilly. It does drop down to the valley floor to visit villages and cross river valleys, followed by climbs of up to 700 ft (200m). There are some short steeper sections, but they don’t go on forever. The highest point is 886 ft (270m). Navigation: Pretty straightforward. Well defined paths, and good signposting. 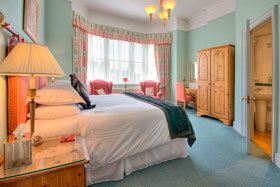 An elegant, beautifully restored Victorian house with luxurious rooms and plenty of character. Located in a quiet part of Winchester, only a short walk from the city centre, you are assured of a warm welcome and a comfortable stay. This traditional farmhouse near the village of Exton has large, beautifully decorated rooms and is full of character and charm. Suzanne is a delightful host and you are assured of a friendly welcome and a delicious breakfast from her lovely farmhouse kitchen. General travel information for the South Downs Way will be included in your holiday pack, including train and bus timetables where available. Detailed instructions on getting to your first night’s accommodation by car, or on foot from the nearest train or bus station, will also be included in the holiday pack on individual accommodation maps. To view train times please visit national rail ,where you can also purchase tickets in advance. For information on bus timetables please visit traveline. By Air: The nearest International Airports to the trail are Southampton (European and domestic flights only) and London Heathrow. There is a railway station at Southampton Airport (Southampton Airport Parkway) with fast and frequent trains to Winchester (journey time approx. 10 mins). Trains also run frequently between London Heathrow (Terminals 1, 2 and 3) and Winchester changing at Hayes & Harlington and Reading (journey time approx. 2 hours). By Public Transport: There is a railway station at Winchester (WIN). Winchester Railway Station is located on the South Western Main Line with frequent trains to and from London Waterloo station (journey time approx. 1 hour). There is a taxi rank at the station if needed. By Road: Winchester is located not far off the M3 motorway at Junctions 9 and 10. If travelling from the North, follow the M6 motorway onto the M40. Leave the M40 at Junction 9 (Bicester/Oxford) and follow the A34 towards Oxford and Newbury. Continue on the A34 until you reach Winchester. Winchester is one of England’s most historic cities and well worth an extra day. It was the ancient capital of Wessex, and seat of King Alfred the Great. Winchester Cathedral has been a place of worship for 900 years and houses, amongst other treasures, Jane Austen’s tomb. King Arthur’s famous Round Table is worth a visit, in the Great Hall, and the City Museum has many fascinating displays and artefacts. There are many places to eat and drink, too. 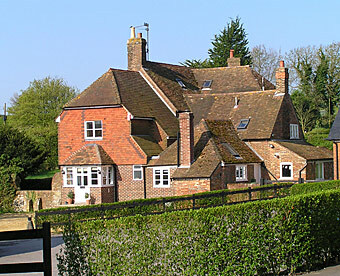 Nestling at the foot of the Downs, Amberley, with its many thatched cottages, is a lovely place for a day off. Amberley Museum and Heritage Centre covers a 36 acre site, and is dedicated to the industrial heritage of the area. There is a narrow gauge steam train and vintage bus service to take you around the site, as well as many traditional craftsmen, such as stained glass makers and wheelwrights. Amberley also has a castle, which can be viewed form the outside, and a train station with regular services to the nearby historic town of Arundel. Enjoy a beautiful, well marked trail though rolling countryside - a great introduction to Britain's long distance paths. Start in historic Winchester, King Arthur's capital city, and pass though many historic sites from pretty villages to ancient hill forts. Discover the rolling chalk heathlands of England's newest National Park, with a great diversity of habitats and an abundance of butterflies and wild flowers.